One of the main things that separates the modern human from previous evolutionary versions is our bipedal locomotion and associated erect posture. Increased brain development largely enabled this function. As our brains continue to develop and evolve, so does our capacity for athletic ability, thanks to increased balance and coordination of systems. Most people know that while we grow inside the womb, the general shape of the body is curled inward in what is known as the fetal position. When we are born, the extensor musculature is not fully developed. As the infant becomes aware of its environment and starts to look and listen, it usually starts looking up at its caretakers. As this happens, it starts to develop a curve in its neck by extending the head backwards. This curve is called a lordosis or lordotic curve. Soon, the baby starts crawling. As it crawls, the belly drops down towards the floor and helps pull the lower back forward to create a lordotic curve there as well. These lordotic curves, combined with the remaining kyphotic curves of the spine, basically cause the spine to act as a giant spring, or shock absorber to adequately distribute the forces of walking erect. If all goes well and we develop these curves properly, neurological function is optimized through a properly stimulated brain, a properly protected spinal cord and a properly balanced musculature. Next, most of us spend the rest of our lives doing things to destroy these normal curves. We sleep in abnormal postures, with our heads pushed forward. We sit at desks reading and writing while having our heads flexed forward even more. We bend forward at out waists while lifting things inappropriately and cause unnecessary stress to our lumbar spine. Robin McKenzie, a Physical Therapist from New Zealand developed a protocol in the 60’s that can be summed up by teaching people to do extension exercises of the spine to improve their lordotic curves and therefore put less stress on the body. There are practitioners who specialize in these exercises, but the basic premise is easy to get and put into practice. Doing extension exercises for the cervical and lumbar spines will do wonders to increase overall flexibility and function of the body. There are a variety of devices that can help as well and many chiropractors like myself use and sell these sorts of devices in the office. When you look at someone with poor posture, you will see a few main things. Forward head translation or posture, a slouching forward of the shoulders and a leaning forward at the waist is very commonly noticed. Most therapists would attribute this to weak back and neck muscles and give their patients exercises to strengthen these. This is important and helpful, but so is stretching some of the overused muscles in the anterior or front of the body, most importantly the pectorals and the hip flexors. Stretching these regularly, will make the biggest improvements in posture in my opinion. There are other steps one should take to improve and maintain normal posture. Sleeping with a supportive mattress and pillow to maintain those curves and neutrality are very useful. Pillows need to be the right size to support one’s individual curvature. Having a workstation that is ergonomically sound is also important. There are a variety of aspects that go into this and I have included some diagrams and resources to use to help. There are specific chiropractic techniques that focus mainly on restoring the curves in the body to the ideals established by studies done using engineering ideals and physics. Chiropractic Biophysics (CBP) and Advanced Biostructural Correction (ABC) are two that come to mind. I believe in weaving aspects of these techniques into my own practice, rather than adhering to any strict protocols. There are hundreds of different chiropractic techniques out there and some practitioners choose to do just one, while others like myself like to use a variety to fit each individual’s needs. All techniques work and I do not put down one over another. Every individual is different and I try to find the best method to restore one’s normal structure, so that they may function more perfectly. That, to me is the essence of chiropractic. Structure determines function. Getting regular chiropractic adjustments is vital in the achievement of this goal. 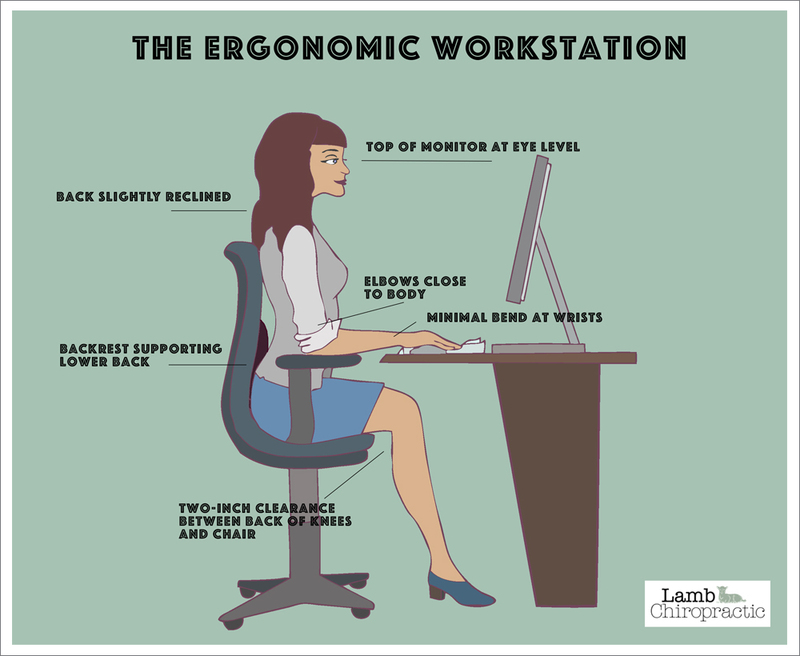 Proper ergonomics and lifestyle modifications are also important. Call our office today 212.883.8700 to start improving your life.